Modern life is short on space but big on ideas – just like us at H&O Plastics. Houses seem to be getting smaller every year. Many modern families, particularly those living in cities, are living in small flats or apartments with very limited space. But we all have stuff that we need to store, so we need to get innovative about how we do it using as little space as possible. Our bucket boffins think they have found the perfect solution – the vertical bucket storage rack. It has a ton of different uses, below are just a few of our favourites. Do you have a messy garage? Perhaps it’s a graveyard for old toys, or just a space to store all those things you just can’t let go of. A bucket storage rack could be the answer. Plastic containers offer the perfect storage solution. They are inexpensive, versatile and reliable. Buckets can be hung, stacked, fixed and carried easier than you can say ‘buckets’. Whether it’s golf balls, paint supplies or bike helmets, just fill a bucket and hang it wherever you can. Many of our buckets come with metal handles, so it could just be a case of hanging them on hooks, or from lengths of string draped from the rafters. Alternatively, the more technical amongst you could build a more complex rack system using whatever you can get your hands on. The one shown in our photo attaches a bucket to a plastic rack using cable ties. Whatever you choose to do you can be sure that your garage will have more space, without the clutter. 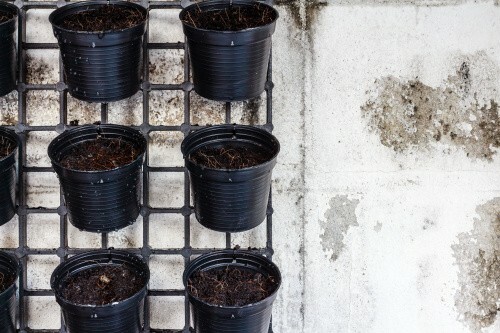 Vertical gardeners represent a particularly ingenuitive bunch. These green fingered go-getters manage without much outdoor space but with a little innovation and plenty of aspiration. In a day and age when greenery is quickly disappearing, it is more important than ever that we get creative to create more green spaces. Whether you want to grow your own veg or just want to put some green back in your life, an H&O vertical bucket garden is the ideal solution. Just mount your buckets on top of each other, make sure they are facing the sun and don’t forget to water them; within no time you’ll be reaping the rewards from your efforts. Pretty soon all of your friends will want one too. Have you made your own experimental bucket storage system? Follow us on twitter and tweet us the results!